This is the longer "European Cut" of the TV series pilot episode, containing 19 minutes of unsatisfying new footage designed to wrap up the story in one episode so that it could be marketed as a stand-alone movie (the rights to this pilot episode are owned separately from the rights to the rest of the series). The picture transfer is identical to the American LD release of the pilot episode, also from Warner Home Video. Japanese subtitles are present in the picture. 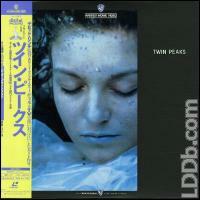 Twin Peaks collectors will note that the haunting cover art differs from the American release, and that the Japanese disc was packaged with a fold-out booklet. Also exists with a "Best of Best 100" obi. Includes extra insert listing other "Best of Best 100" titles.